The "Video Overlay Configuration" is the software that you need to use to design the graphics overlay that the VIDEO4 system adds to its video recordings. The video overlay can be almost any combination of bitmaps, dials, bargraphs, text and numerical values. It is also possible to only show particular graphics under particular conditions making it very flexible and powerful. Files generated from the Video Overlay Configuration have the VGL extension (Video Graphics Overlay). VGL files contain both graphics overlay and VIDEO4 configuration data. Note that a number of example layouts are also installed with the software. So it is not necessary to design your own unless you have an application that requires it. 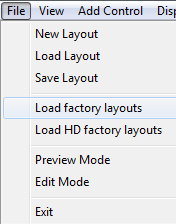 To access the example layout directories use the menu items - "File -> Load factory layouts" and "File -> Load HD factory layouts"
The software doesn't include any method of editing the bitmaps, that must be done on an external application and loaded in. The following section describes how to put the configuration(VGL file) into VIDEO4. Rename the Overlay file (configuration file) to DEFAULT.VGL and copy it to a formatted CF card. Insert the CF card to VIDEO4 unit and power it up. All the LED indicators on the front panel will light up; At this moment VIDEO4 starts to copy files. If the copy is successful, DEFAULT.VGL will be moved to a folder named DONE. Now VIDEO4 is ready to proceed with the new Overlay file. Variables Pane – this lists, in tree view form, all of the variables that can be assigned to a control. Design Pane – this is the design area where users can place and arrange the layout of controls.